On fresh boot the system reaction times to typical events (window key, typing, etc.) was normal but over time it degraded to where it was multi-second. At first I thought something was off elsewhere (new rig) but then I saw a thread talking about how DF might cause this. In that thread the moderator suggested disabling application hooks as part of the testing. Worked there so I tried it on my install -- and what do you know -- system response time to typical events returned to normal (ms). Is there a way to not have to disable the hooks? I ask as turning it off turns off notable aspects of the DF product (i.e. drag drop to virtual monitor with immediate full sizing). Let me know. For now I'll try to just manually size the windows to the configuration I am running (1/3,1/3,1/3) and move between them w/ the DF icon in the title bar (that still works w/ hooks off -- wont resize but does move the window to the next virtual monitor). Could you enable debug logging, re-enable the hooks, and when it starts to slow down again, send me a copy of the log? It'll hopefully show what the hooks are doing, it could be that it's getting flooded with messages from some other program that's being hooked. Thanks for looping back. I flipped it back on. Here is a log file that included some slow lag events -- i.e. slow type response, slow windows key launch, etc. WIll be curious if you see anything. Thanks for taking a look. I do appreciate the product (critical for effective use of a ultrawide screen). Thanks! Unfortunately I don't see anything out of the ordinary in the log. When the issues start showing up, if you start exiting programs that you have open, do the performance issues go away after exiting a certain one? Thanks for looking. I'll test out on the lines you are suggesting (see slow behavior - close one app and see if lag goes away). I do like the product so glad to hear its not the culprit. No worries, thanks for the kind words! If you're able to track down which application is contributing to the issue, definitely let me know and I'll test it with DisplayFusion to see if there's anything we can do from our end as well. I was having this problem and followed your instructions. For maximum irony, the app that was conflicting with DisplayFusion was Resource Monitor. Quitting EITHER Rsource Monitor or DisplayFusion fixes the performance problem I was seeing. My performance probem was very easy to reproduce: just scrolling a long list in Task Manager or Windows Explorer was unbelievably choppy. Logs of the bad performance are attached. Interesting I'll have to try that (closing out resource monitor when I see the issue next time). Interesting! You guys are referring to the Resource Monitor that's built-in to Windows? I was just going to fire it up (Use Windows-R to open the run box. Type perfmon.exe /res, and hit the Enter-key) when a lag spike was happening and then kill processes that were hitting CPU, Disk, or Memory excessively and see what happened - LOL. 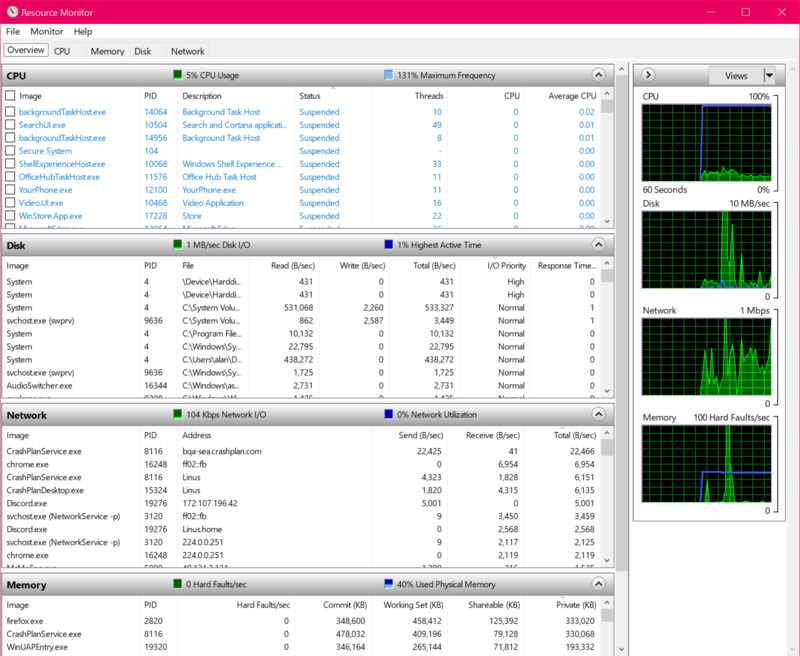 By default I don't think resource monitor is running -- right? Or is the resource monitor I indicate above different than what altano was thinking? Strange! No issues for me when I run that here. Can you do a "winver" at the Run prompt and let me know which version of Windows 10 you're on? How long does DisplayFusion need to be running before you start noticing these issues?